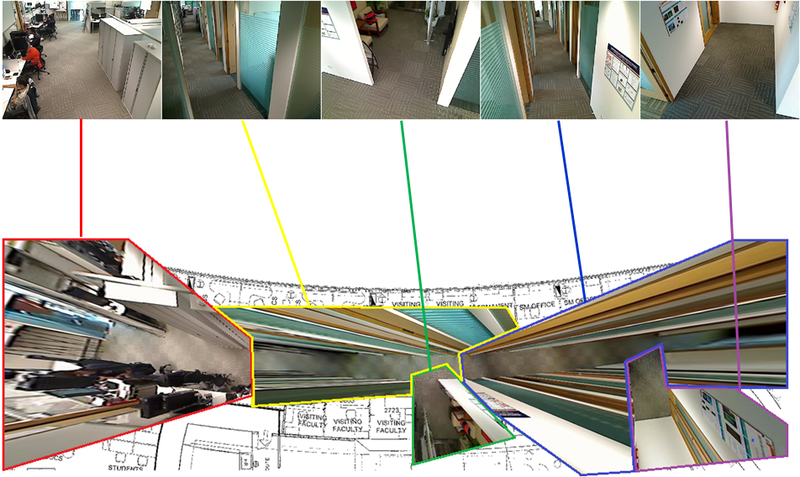 The Smart Office integrated demonstration is a collaborative effort between different ADSC groups including face recognition, activity understanding, 3D audio, differential privacy, and smart grid. Our group is responsible for registering imagers and tracking people across multiple imagers, building off the work from previous work. Ultimately, the projects should come together to analyze and understand the typical daily activities taking place at ADSC, using data gathered from a variety of low-level sensors that observe aspects of the office environment, objects, and people, and their actions and interactions. Click here for a quick introduction presentation to Smart Office (ppt). A blueprint of the floor with camera location and orientation. The five camera feeds registered to the blueprint. Employee tracked across multiple imagers.